The aroma from the citrus will be enough to alert the neighbors and those driving by that paska is in the oven. Perhaps, consider closing your windows. I've graduated to using a dough machine. For years, I kneaded my dough by hand and found this a relaxing and actually quite satisfying task. I haven't added the exact amount of flour to add because, every regions flour is different and the humidity makes a difference. At first you can add 5 cups of flour and then start to add in 1 cup at a time. The dough will never really lose its stickiness. If it does, it is probably too hard. You will know it is ready to rise when you push into the dough with your fingers and it springs back. At this point I'm feeling really bad for my celiac family and friends. When I'm a month from Easter, I shape the Paska into loaves, just like bread. For Easter I make little buns and put them in muffin cups, and I also make braids. It all tastes the same, and we actually put a little icing on every slice (so bad . .so good) and so no one really cares about the shape of the loaf. Ah, I wish I had a scratch and sniff button for you. As soon as it has cooled enough, put them in bags and into the freezer unless you plan to eat them all in the first day. Even one day on the counter takes away from the freshness. Add the yeast to the warm water and the sugar. Let sit for 10 minutes until it has poofed. The general rule for this is . . if the lemon and orange is very thin skinned, then just chop it up skin and all and remove the seeds. The lemon and orange that I used today was thick skinned. Instead of using a grater to remove the rind, I just use a vegetable peeler. Peel it and then chop up the lemon and orange and remove all the seeds. Put this all in the blender. 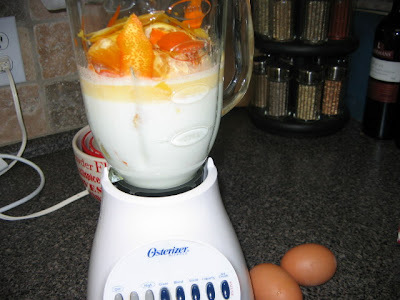 (If you needed to peel your lemon and orange, then take off the white pith and then add the peel and the rest of the orange and lemon to the blender). Put the butter and milk into a microwave measuring cup and heat in the microwave for 2 minutes and then let sit until the butter completely dissolves. 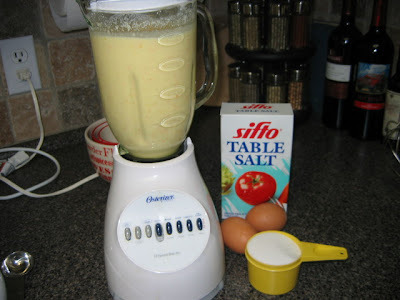 Add the butter and milk to the blender. Blend on medium for three or four minutes. Add 2 large farm fresh eggs. Continue to blend another minute. *Measure this . . .it should measure approximately 4 1/2 cups. 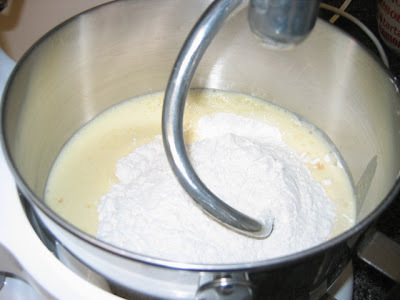 Continue to add flour until the dough is soft and holds its shape. Add 1 cup of flour at a time. Knead until elastic and manageable. You should use about 7 - 8 cups of flour. . .you will be tempted to use more. . but allow it to remain a bit sticky. . it will be fine. 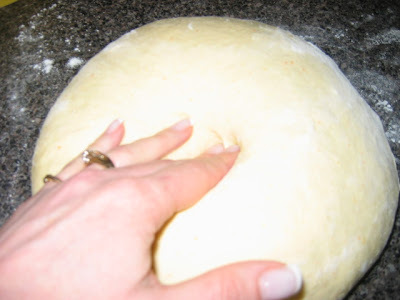 Put the dough into a large bowl and cover with plastic wrap or a lid. (rub a little oil over the dough so it doesn't stick so bad. I sometimes let it rise a second time, depending on my mood and time. Let the dough rise until doubled, another hour at least. Bake about 20 minutes for loaves and less for smaller. It should be golden brown. If you take it out too soon it will fall a little bit but still taste wonderful. If you have a convection oven bake it at 325 for about the same time. The length of time will depend on the type of pan you use. Now this icing is what I grew up with. Nothing duplicates it for me. It is simple but somehow really yummy. It has raw egg whites so if that is an issue for you, substitute regular butter icing or use pasteurized egg whites. Icing Sugar to make a soft icing. Beat this together until smooth. It should be really soft because it will firm up in the refrigerator. Put this in the fridge and use sparingly or not, depending on you will power. * If you are serving this icing to small children or people with compromised immune systems...consider that you should use pasteurized egg whites or use meringue powder plus water in place of raw egg whites. Happy Baking Lovella. My family is asking for paska already too but I haven't found the time or energy yet. I do have your recipe and I have made it for years and passed it on like crazy. I even put it in our church's 70th anniversary cookbook 8 years ago. I called it "Lovely Paska". I have tried other recipes but I always come back to yours. 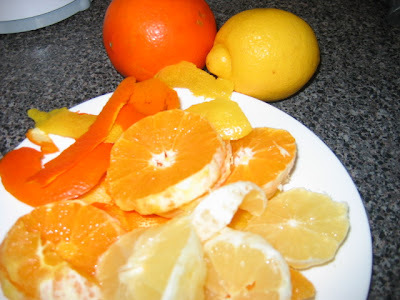 Although I leave out the rinds of the lemons and oranges. I dont' know if you remember giving me this recipe many years ago. My meas. are about 50% larger - I don't know if I changed them or if you have, but I have written down about 11 - 12 cups flour, (so this recipe may be 7 - 8 cups?) the dough is sticky but that means it will be good! I wasnt' a big fan of paska until I had these and my family cannot understand why I only make them at Easter! 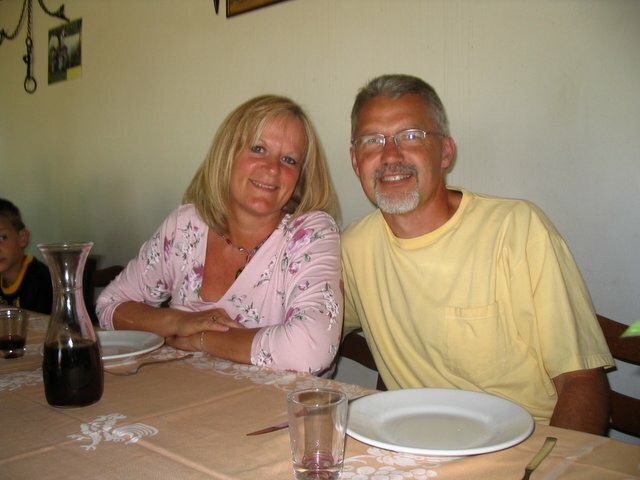 With them being all over the world I have broken down and them at Thanksgiving! I've been grateful for our friendship that led to the sharing of this and other recipees. 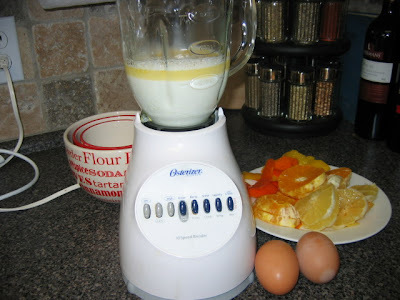 By the way, I just chop up the whole lemon and orange, leaving on the rind, and I don't put the warm milk in the blender, just straight into the bowl. The icing is the best too!! !Sometimes I feel guilty about the raw egg white, but I feel better to know you still use that recipe! Oh I didn't remember about the icing. This is our families' favourite icing. On paska or cakes we just love it and the raw egg white think just doesn't bother me at all although I know it does some people so I don't mention it usually. I'm reading your post and my brain is going: Clay flower pot. So I dug out my college notebook on Eastern European Recipes and there is it: Paskha (Easter Cheese Pyramid) Russian. "If you do not have a paskha mold, a 1 qt. clay flower pot will do. Set the pot in a soup plate, and line pot with double thickness of damp cheese cloth." This weird recipe is for a cheese like spread however, not a baked bread! I guess Paska and Paskha are totally different foods! What a difference an "H" makes! Regardless of names, I'm going to give your recipe a whirl. Oh Boy, Jill I'll never be able to explain why Mennonite food isn't the same as Russian food. I'll give it a really quick try. Mennonites were a group of people who originated from different countries, some from Holland, some from the Ukraine, and Russia. They essentially were without a homeland because they were persecueted for their faith and moved from one area to another to escape. My parents really didn't feel Russian even though they were born there. The Mennonite recipes were ethnic rather than a from a "country". After all the research that you just did, and it is amazing , I'm thinking I should do a few posts myself on my heritage. It is quite fascinating as well. There is incidentally a cottage cheese/cream cheese spread that we often put on our Paska. Also, my mom baked her paska in old peanut butter and yeast tins. Oh...wow! This looks wonderful! I will have to try this recipe soon! I could just about 'eat' your post, Lovella, and I think it IS gluten-free !! Yummy! This looks SO good! I can smell it all the way to my house. . .
ps. Rick's mom makes that cottage cheese/raisin spread as a side dish with paska. Rick loves it - me, not so much. This is a new food to me and it sounds delicious. I, too, wish you had a "sniff button." I will add the recipe to my file. One word...YUM!! Great tutorial and sounds like a recipe I will try this Spring...thank you for posting it! Wow, Lovella! This looks incredibly yummy! I've never even heard of Paska, but I can just imagine the citrus-scent wafting through my kitchen... oh, sorry! I began to daydream a bit! I, too, wish you had a scratch-and-sniff feature on your blog. Thank you for sharing this recipe. I do believe I'll be making this one soon. I did it! I made your recipe! As promised, it smells and tastes so wonderful! Thank you! 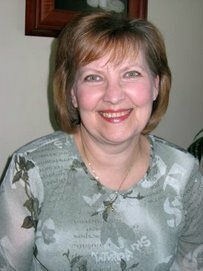 I'm from the East (PEI) but I attended Winnipeg Bible College (now Providence College) and was introduced to lots of Mennonite and Ukrainian recipes. I think I made Paska bread but I seem to recall that that particular recipe took 12 eggs! I wasn't an accomplished breadmaker at the time so I don't think it turned out that well. Your recipe looks so delicious and I just happen to be on March break this week so....I think I'll be giving it a try! I'll let you know how it turns out. I just made 7 loaves of paska for a fundraiser bake sale. Paska bread is always sold out! I haven't used the blender method and that gives me the excuse to make another batch...an extra 30 min of walking will be needed!! By the way -- I bloglined your blog when I found it, and I'm hooked! I am enjoying your posts very much! I have never heard of this bread! But it looks oh so yummy! 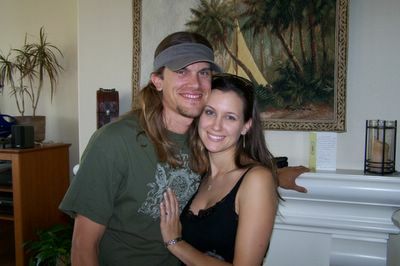 I popped over (for the first time today) from Jodi's blog. Her bread pictures looked so delish that I had to find out the recipe. I'll enjoy looking around a bit! Thank you! Thankyou!! I have been looking everywhere for a recipe like this one. I'm Swiss Mennonite but was introduced to paska while at school in Winnipeg. Looking forward to making this for my family! I promised my son that we would bake bread today (on his day home from Kindergarten)...thinking of my Mennonite Oma's citrusy paska...and the only recipe I could find in my books that looked right called for 20+ cups of flour--a little more than I wanted to take on today, so I'm going to try yours! 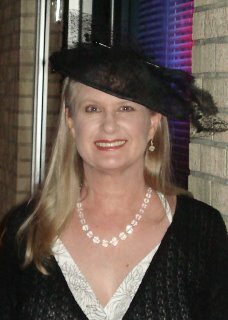 It's the first time I've been on your blog site--and I love it! Thanks for the great recipe. 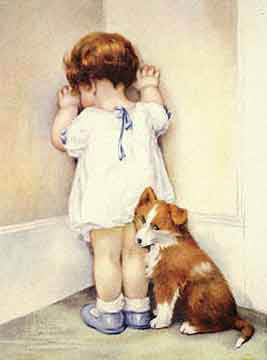 I was searching the internet and this seems to be the most similar to what i grew up with here in British Columbia. I think I'm going to make it this afternoon while the sun is shining in my kitchen window - gives me a place for the bread to rise! I grew up in Abbotsford, BC and although I'm not Mennonite by heritage I attended a Mennonite church. Now I live in Seattle where most people don't know anything about Mennonites nor their food. We are having friends over for Easter dinner and I wanted to make Paska. Thanks for the recipe, hopefully it will turn out. It is a pretty big recipe (seems all recipes for Paska are big!) so I"ll have to bring some to work too. Minunkin mielestä paska on hyvää ruokaa. I just made paska for the first time and I used your recipe. It is the most delicious thing I've tasted in years! I just hope there's a slice my Oma can sample, it'll knock her socks off! Mmm, I can eat the icing all by itself, it's so good! 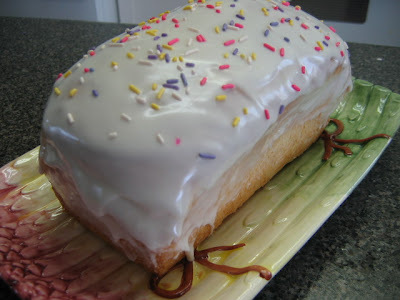 i have made , and loved paska for years, Our wedding was in spring of 77. the table center pieces where,....you might have guessed it, iced, and candy sprinkled Easter bread paska! We used to make them in large empty tins, the real big ones, a little tricky with the baking portion, because of the amount of rise, and the sometimes issue of having them to close to the top rack, or even touching the element. but in my mind nothing looked as nice as a tall , evenly iced center piece that you get to eat. from mid manitobia thanks. My family also has a traditional paska recipe, and even though yours looks delicious, I have to stick with Mom! I am wondering if you have ideas for baking tins though. My Mom always used coffee tins, but now they are ribbed on the inside. any suggestions? I know I can just bake it in a loaf pan, but I like the tall look with a bit of a mushroom cap on top. My Mennonite mom, Oma, and Great Aunts all made paska every Easter, in a coffee tin so it looked like a giant mushroom when it came out. They also served it with the cottage cheese spread (they call the spread zierne paska), which was its saving grace - it was such a pretty bread that they would leave it on display, surrounded by coloured eggs. Unfortunately, it would dry out a fair bit while on display - but the zienre paska had some moisture and lots of rich flavour to save the day! I see I was here before :) but this year I really am going to make it. I'll let you know how it turns out. Hi there, i'm so glad i have found your recipe.My grandmother a fantastic mennonite baker whom lived in Abbotsford, BC passed away this year and i never got the recipe for Paska from her.I'm sure after 80 years of making it, the recipe was not written down anywhere but in her heart!I'm not as accomplished of a baker as her but i'm willing to give this a whirl, i mean even if it dosen't taste the same, when you look at the ingredients there is no way it can be bad! I came up with wonderful results as well. My "tweaking" was to add two more eggs and two tablespoons of cardamom. Our family loves paska as well, but we were always deterred from making it because of the time it takes to make. This was my first time making it on my own, (usually my Mom and I do it together) and when it was rising, and actually working, I did a little paska dance in my kitchen. I live in Denver, CO, and we frequently run into issues with how well the bread rises. I'm sure the blending technique helps to lighten the bread. My Grandmother, Mom and Dad all agree, it's the moistest and best Paska they've had. The Eastern Orthodox church celebrates "Pascha," whereas the Western Christian churches celebrate Easter. During Lent, people fast from eggs and dairy, thus at Pascha they eat breads made with eggs and dairy as a celebration of Pascha and the coming of the risen Christ. I'm guessing we Mennonites just took on the tradition of making Pascha bread, but didn't associate the word Pascha with the entire celebration of Christ's death and resurrection. Because we go to an Orthodox church, it took awhile to get used to singing hymns that talked about Pascha. I found it hard not to laugh and imagine that I was singing a hymn about a huge icing-covered loaf of sweet bread. Huge thanks for this great recipe. We are spending our first Easter as ex-pats and are missing the traditions from home. The paska is usually made by my mother-in-law, so I decided to surprise my husband and give it a whirl. He's still smiling. Thank you for posting this WONDERFUL recipe. 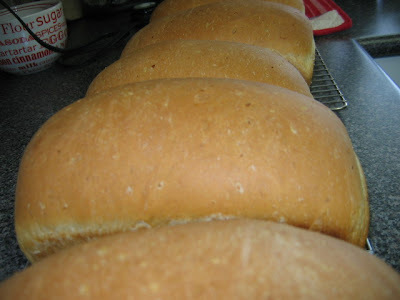 I just made it for my family, and it IS possibly the best sweet bread I have EVER tasted. Fabulous. I'll be using more of your recipes in the future, if they are all this superb. My favourite recipe book, with my mom's paska recipe, is packed up for moving. But I knew I'd find a good one on Mennonite Girls Can Cook. You mentioned adding some vanilla pudding mix. My mom always added lemon pudding mix. Adds that extra bit of lemon flavour. I'm looking forward to trying out this recipe and sharing the results with family and friends. my dough is sitting in the fridge right now waiting for me to get home to shape and bake. For those who want to use coffee tins with the ridges---just line the coffee tin with some parchment before dropping in the dough. this should give you a nice smooth loaf, easy to get out of the tin. And, if your paska gets a bit stale from sitting out, toast it(cut off the icing first). we discovered that toasted paska is just heavenly! lovella, i just wanted to stop by and let you know that i am jetting off to the grocery store with 2 little boys (and a baking baby girl) in tow to collect all the ingredients to make my First Ever Paska!!! eee! i'm excited and scared all at once. and i'm a little shame-faced to see that i was the 2nd person to comment on this post over FOUR YEARS AGO and i said i was going to make it and never did. With your very helpful tips and my sister's recipe, which is like yours, I baked my very first Paska. It was an honour for me to do for I a Menno girl from MB now living in Germany decided to try it for my niece is here on an exchange program, so I thought it was something we could enjoy together. I especially like the Paska buns, thanks for that tip. 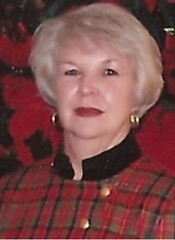 Enjoy your blog and the MGCC and Congrats on the cookbook. I made the bread and I think it turned out great. My husband is mennonite and he told me to try to make it. He suspicious cause only 2 eggs. But he says it tastes good. Going to our very large mennonite family gathering tonight. My fatherinlaw has 9 brothers and sisters, so it is a very large gathering. We are using our churchs kitchen and banquet room tonight for supper. the weather is not favorable for using someone's house, the children need space to run. Lots of kids. I will definetly make this again, especially because I don't think it is all going to make until Sunday. I just want you to know that I look forward to making this paska every year, since I found your blog and your recipe, I haven't used any other recipe. The raves are great, and you are right, I have to make more and more!! Thanks for the great recipe. Do you have any ideas how the dough would keep in the fridge to make a Paska fresh on Easter morning (a la Artisan Bread in Five Minutes a Day?). Maybe refrigerate after the first rise?? I love paska, but it does dry out very quickly, and I'm not going to wake up at 4 am to make it fresh before sunrise! Hi...I have never tried to refrigerate the dough. I always freeze mine once it has completely cooled. I thaw it in a fresh bag to avoid the crystals from dampening the loaf once it thaws. I will try it and let you know...but if you are planning on doing that today...you would be better off freezing it. It freezes really well. My recipe is not dry....at all. I'm surprised to see your recipe for pasta because I always thought it was a Ukrainian tradition. Thank you for such a lovely recipe - it turned out beautifully and I can't wait to serve it on Sunday. This is the Paska recipe you've been waiting for as we celebrate the One mankind has been waiting for this Easter season. This is the Paska recipe you've been waiting for as we celebrate the rising from the dead of the One humankind has been waiting for. Delicious, moist, airy . . . go ahead and trust the moisture notes Lovella has made. I did end up going a bit over 8 cups, but stopped as per instructions. Once risen the dough will be soft but manageable. 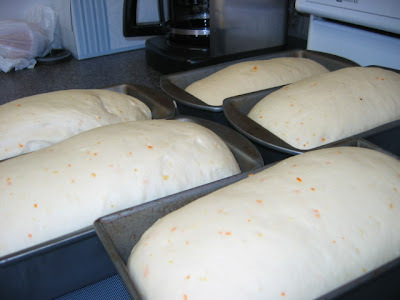 With this recipe I made 2 loaves and 2 braids. Greatings. This is 2013, a week or so before Easter. About 5 years ago I searched for paska so I could make it for my Grandchildren. What I found was a recipe from Manitoba for a bread machine. Very similar content. Great tasting result but it pushed the top of the machine oopen before it was fully baked. Lovella, your paska recipe is the best ever!